Efforts to reach the full therapeutic potential of macromolecules (biopharmaceuticals) for clinical care are thus limited by a lack of effective, efficient and convenient drug delivery. The drug delivery mantra of getting the right drug to the right place for the right amount of time provides a good starting point to address limitations of both small molecules and macromolecular therapeutics. Biologic therapy has revolutionized the medical treatment landscape. However, simplicity and ease of administration remains a challenge to achieve long-term patient compliance and optimal therapeutic outcomes. Given the high cost of biologic therapies, it is the duty of pharmaceutical companies to develop non-invasive formulations that improve patient acceptance and efficacy. Partnerships are an increasingly attractive pathway for accelerating development from basic biological understanding to formulation considerations. This comprehensive guide serves as a concise reference manual of oral drug delivery platforms for pharmacy students, graduate students, interns and new pharmaceutical scientists. Nearly all APIs can be formulated into a suitable drug product – the challenge is to provide a better formulation that will provide a patient benefit. 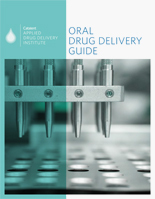 The Oral Drug Delivery Guide provides an overview of drug delivery techniques and can serve as a key tool to help solve bioavailability and drug delivery industry challenges. The Catalent Institute collaborated with our partners at the American Association of Pharmaceutical Scientists (AAPS) by launching the 3rd Annual Global Academic Competition in the fall of 2013. Graduate students studying life sciences, pharmaceutical sciences, and chemical engineering from universities around the globe had the opportunity to write review articles on one of seven drug delivery topics. This survey is designed to receive patient and caregiver insights, in order to better understand the unmet needs of patients when managing lung cancer, also the impact that treatment has on the patient overall, managing other disease states, and daily living. 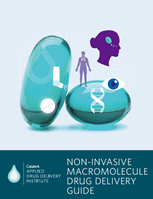 Chairs of the Non-invasive Delivery of Macromolecules Conference share the latest developments and insights from the February 2017 conference in San Diego. Presenters from BASF, the University of Bath and Catalent Pharma Solutions discuss drug delivery technologies from hot melt extrusion to pulmonary delivery, bioavailability enhancement tools, and emerging technologies. Participants will compete for one of five prizes of $2,000, a complimentary, one-year AAPS membership, and the opportunity to have their submissions published by Catalent in the Institute and/or industry publications. Kurt Nielsen, PhD, chief technology officer and senior vice-president of R&D at Catalent Pharma Solutions, discusses the vision behind the Catalent Applied Drug Delivery Institute and how can the Institute help get better drugs to waiting patients. 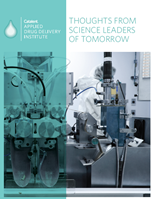 To understand the extent of the challenges and the technologies for bioavailability/solubility enhancement, Pharmaceutical Technology partnered with the Catalent Applied Drug Delivery Institute to review what is needed to resolve the myriad of challenges in developing oral formulations of poorly soluble drugs. 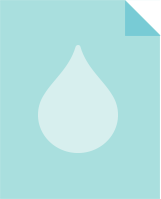 Kurt Nielsen, PhD, chief technology officer and senior vice-president of R&D at Catalent Pharma Solutions, discusses strategies for solubility and bioavailability enhancement of poorly water-soluble drugs. Kurt Nielsen, Ph.D., Chief Technology Officer and Senior Vice President, R&D, discusses strategies to resolve bioavailability and solubility challenges with Patricia Van Arnum, executive editor of Pharmaceutical Technology and Pharmaceutical Technology Europe. The “patent pending” OptiForm® Pro Web Tool allows drug development professionals to explore more options in solving the most challenging aspect in drug development, determining the optimal finished dose suited to your specific product requirements, target indication and molecule properties. The Institute aspires to harness the knowledge of some of the world’s leading experts in drug development, delivery and formulation.